Take part in the cycling tour off-season to enjoy smaller group sizes. We are comparing Scenic Madrid City Cycling Tour Prices from leading ticket suppliers and Try to find you Cheap tickets prices on the market. Discover Madrid by bike! On this mostly flat route you will cycle down picturesque backstreets, past street cafes and shops, through pretty parks and traditional squares, along cyclist-friendly streets and along some busy city roads with cycle lanes as you pass by Madrid's top scenic sites and attractions. Learn all about the city and the sites you are passing from a friendly guide who will give the tour in the language specified with a maximum of 15 participants in one group. Sites you'll pass vary by tour operator but generally include the Royal Palace the San Nicholas church, the Reina Sofia museum, Plaza Mayor, Puerta del Sol, Parque del Retiro, the Prado museum and Plaza Cibeles. The city cycling tour takes 3 hours, cycling at a comfortable pace, and includes a break for refreshments halfway through. This tour is made for you if you dislike or are fed up of walking tours and want to see the city with a live guide in a different way! Although the tour is suitable for even novice riders, some experience riding on city roads is recommended to help you feel safe. You'll need to be of a certain fitness level to be able to keep up with the group/guide, there is not much time to rest between places until you reach the refreshment break. Kids aged 12 years and over are welcome though some tour groups will alter the tour to make it suitable for those as young as 8 years. Your Experience With Scenic Madrid City Cycling Tour ? Meet at the agreed location on the morning of your tour and collect your bike plus safety helmet. 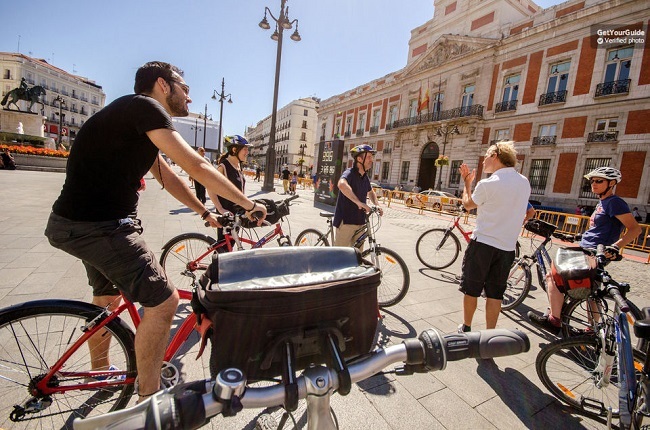 On the tour you will see Madrid's top attractions as you ride down backstreets, past cafes and boutiques, through typical Spanish squares, on some city roads using the cycling lane, passing by the most historic buildings in Madrid. With up to 15 other participants you will pass sites such as Temple de Debod, the Royal Palace, Casa de Campo, the San Nicholas church, the Reina Sofia museum, Plaza Mayor, Puerta del Sol, Parque del Retiro, the Prado museum, and Plaza Cibeles – Sites varying slightly depending on which company you book with. Learn about the places you're passing from a knowledgeable and friendly bilingual guide, you can even ask them for restaurant recommendations and what they advise you do for the rest of your stay – They're happy to offer some insider information! You will stop for a coffee break half way through the tour where you can get out of the saddle and give your legs a rest before continuing on to see more of Madrid. Check your inbox after the tour as your guide will have been taking photos along the route which will be emailed to you. What Scenic Madrid City Cycling Tour Includes? A 3 hour cycling tour around Madrid with up to 15 other participants plus a friendly and knowledgeable bilingual guide who will guide you around, past and through some of Madrid's top sites. Tours will take place in the language specified; either English, Spanish, French, German or Dutch – Each booking site varyingo n which languages are offered. Use of a regular bike plus helmet is included in the price of the tour, other types of bike may be available with a surcharge i.e. tandem bikes, electric bikes, etc. A break for coffee is scheduled half way through the tour. Photos will be emailed to you after the trip – Check your inbox! Unbiased comparison of Madrid's City Passes(MADRID CARD VS MADRID ART WALK CARD VS IVENTURE PASS VS TOLEDO) based extensive research, Tripindicator team came up with comprehensive recommendations which helps you choosing Best Madrid Skip-line attractions pass for your travel. Unbiased comparison of Madrid's Hop-on Hop-off Bus Bus Tours operators(MADRID HOP-ON HOP-OFF CITY BUS TOUR VS EXPRESS TOLEDO BUS TOUR VS PANORAMIC MADRID SIGHTSEEING TOUR) based extensive research, Tripindicator team came up with comprehensive recommendations about Madrid Hop-on Hop-off bus tours which helps you choosing Right Madrid Sightseeing Bus Tour for your travel. Wear suitable clothing and footwear, and put your belongings in a backpack to easily carry whilst cycling. Arrive 20-30minutes before the scheduled departure time to allow time to select a bike and get kitted out with a helmet. GetYourGuide also offers a private tour which is available to book for €50 per person. During the Summer the private tour can be booked to start at any time up to 11am, in the Winter months the private tour can be booked for 3.00pm. Exact sites you'll pass vary between company/guide. Languages other than English require a minimum number of participants so may be cancelled. Cycle tours may be cancelled due to bad weather – You'll be offered a tour on an alternative day or a full refund. Travelers Reviews about Scenic Madrid City Cycling Tour ? Visitors talking about this tour on TripAdvisor and Getyourguide are, for the most part, extremely happy with this cycling tour, most people giving it a 4.5 or 5 star rating saying it's a great way to see the city. People say that their guide was very knowledgeable and also friendly with a wealth of insider knowledge on the best places to eat and what they'd recommend you see and do on the rest of your time in Madrid. People have described it as 'The Best Thing I Ever Did On A Trip!' and 'Even More Awesome Than I Expected'. Some travellers reported feeling rushed with not enough time to rest between sites if they were in the back of the group. Some people also felt unsafe riding on the short parts of the trip that require being on the busy city roads. Instant confirmation when you book online. Printed tickets and e-tickets are accepted. Free cancellation with a full refund 7 days before your tour with Viator, or 24 hours before departure with GetYourGuide. Wear the correct clothing and footwear – No loose clothing that can get caught in the wheels. Make sure you know where you're departing from. Check your inbox to make sure the tour is still taking place – Some times it is cancelled due to bad weather. Carry your possessions in a backpack for easier cycling. Departure point varies with each booking company – Check your booking confirmation.